When Apple introduced the iPhone 6s at its September 9th special event, it billed the new model as the “best phone for traveling around the world,” thanks largely to support for “23 bands of LTE wireless networking.” But that day, the new iPhone’s tech specs page told a more complex story: Apple advertised a seemingly U.S. and Puerto Rico-specific A1633 iPhone 6s with 23 LTE bands (including AT&T’s exclusive band 30) but no CDMA support, while Sprint, T-Mobile, Verizon, and every international carrier outside China got an A1688 iPhone 6s with 22 LTE bands and CDMA support. Clearly, the “best phone for traveling around the world” would be the international A1688 version, right? 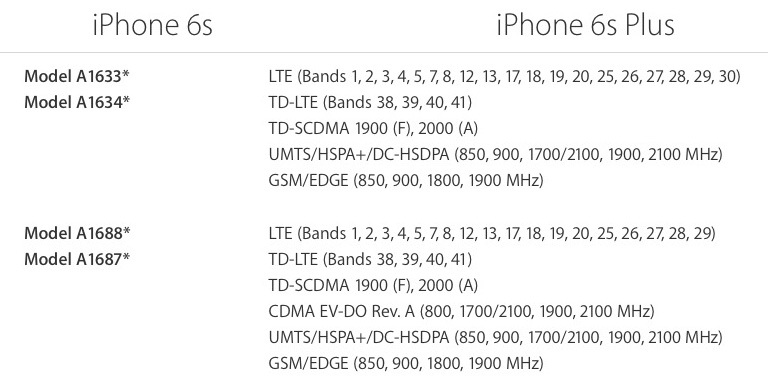 Archive.org’s Wayback Machine confirms that Apple changed the iPhone 6s tech specs page (shown below) at some point after the September 9th event to note that the A1633 model actually does have CDMA support after all. On the A1633 (and iPhone 6s Plus model A1634), the line noting CDMA EV-DO Rev. A now appears below the UMTS line, with the same supported frequencies as the A1687 and A1688 models below. In other words, if you bought a Verizon, T-Mobile, or Sprint iPhone 6s thinking that you were getting Apple’s best worldphone, too bad. The updated tech specs page suggests AT&T’s version has all the same features, plus an extra LTE band for improved performance on AT&T’s network, which means the A1633 should deliver optimal performance on any U.S. or international carrier outside of China. Also interesting: Apple’s pages differentiate between A1688 (GSM) and A1688 (CDMA), hinting that there may be software or other locks on the Verizon/Sprint and T-Mobile/international GSM phones, while no such distinction is made for the A1633. Who will be affected by this? 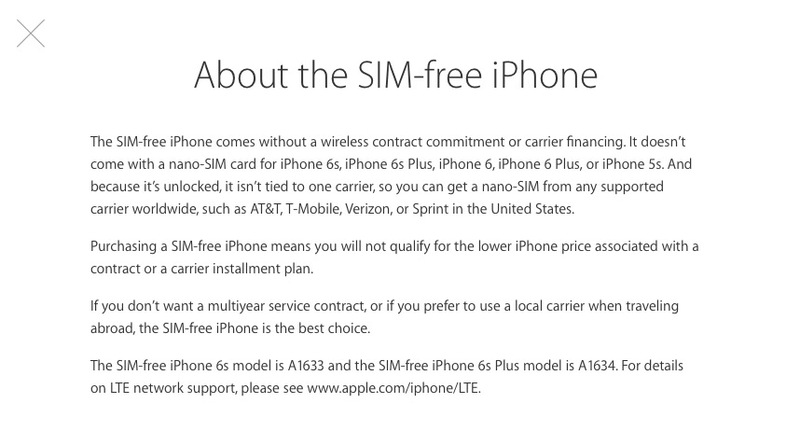 If you’re a Verizon, T-Mobile, or Sprint customer who bought an iPhone 6s or 6s Plus with thoughts of possibly switching to AT&T, you don’t have the best phone to take advantage of AT&T’s network — and may want to get a SIM-free phone instead. But if you’re an AT&T customer who worried about using your phone on a CDMA network, you may be in better shape when switching carriers than you’d originally expected. Update: Apple has confirmed to Macworld that the A1633 and A1687 iPhones are identical to one another except for the A1633’s added support for AT&T’s LTE band 30 — currently only available in limited U.S. markets, but possibly coming to international markets in the future. As Macworld notes, Apple declined to comment on why it would “manufacture two sets of ostensibly almost identical phones that they sell at the same price,” but the conclusion is clear: if you want a iPhone 6s with the broadest possible network support, AT&T’s version — unlocked — is Apple’s best option.